Congratulations! 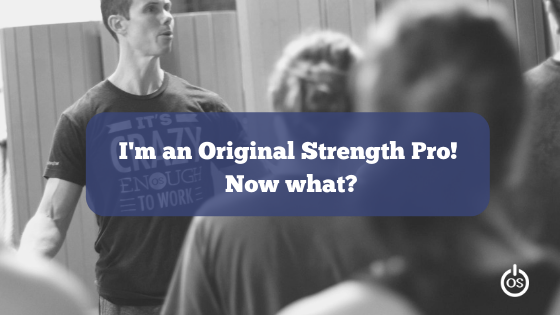 You’ve gone through the Pressing RESET workshop AND Original Strength Pro RESET Workshop. You’ve experienced the power of this simple, powerful movement system, delved deep into the nuances that set OS apart in the world of movement improvement, and have set YOURSELF apart as an instructor or coach with borderline super powers (as far as your students and athletes are concerned, anyway). you stay a hobbyist or transform into a true master of your art. Or, to quote Spanish novelist Miguel de Cervantes in Don Quixote: “It’s the road, not the inn”. And so it goes with Original Strength. Now that you have your black belt, the journey can truly begin. coaches and eager students – is an unmistakably valuable part of the journey. the next often happens at astonishing speed. propel you forward faster and faster until you reach a fork in the road. One sign will point you in the direction you’re already going – a great option no matter who you are. heights of strength and athletic performance that picks up where Pressing RESET and OS PRO leave off: Original Strength Performance. in the weight room and on the athletic field. Original Strength Performance’s material is not just for professional athletic coaches, however. level drills to ramp up their own personal strength and performance in record time. unique and head-slappingly simple ways that build upon what I learned at OS PRO. yourself and your students to attend OS Performance. the view from brand new heights of strength and performance! among the first crop of Original Strength Instructors. He grew up scrawny, unathletic, weak, and goofy until he was exposed to kettlebells and the teachings and methodology of Pavel Tsatsouline in his early 20s. He has taught or co-instructed at workshops in 6 countries (US, Israel, Italy, Czech Republic, Slovakia, Australia) and recently returned to the US after 4 1/2 years of living in Israel. He is currently based near Philadelphia, PA and spends his time teaching clients both in person and online as well as spreading the word of StrongFirst and calisthenics. He regularly writes about strength and health both to his popular email list and as a guest author on other websites. Find him online here.